UMP | University of Minnesota Press Blog: Imagining Another Television. The term “utopia” is most often used to refer to a place (most frequently an imaginary one) as it was in Sir Thomas More’s book of the same name. More’s Utopia (1516), of course, was followed by plenty of other representations of “perfect” societies. There is no single motivation behind such representations: at times they are driven by critical or satirical intent, at others by a practical program that the author seeks to undertake in reality, but in some cases, purely by a desire to imagine what it might be like to live differently, or what the future might hold. Moving beyond the realm of the literary, the term is also frequently applied to a particular orientation or attitude, often pejoratively: one dismisses as “utopian” plans that seem impossible to achieve or that fail to adequately consider the reality of the present in their aspirations for the future. But what if we were to think of utopia not so much as an imaginary place that can be represented or a future condition to aspire to, but rather as a mode of thinking? In his Valences of the Dialectic, Fredric Jameson explains how one might apply “utopia as method,” a thought process through which “what is currently negative can also be imagined as positive in that immense changing of the valences that is the utopian future” (423). Utopian thinking, then, would entail imagining how what currently exists could, through our imaginative projection of its development or its future, be the basis of something better, the initial condition of a more positive future state. This way of thinking, however, need not be identified with the formulation of actual utopian plans: it is not necessarily a way to decide on a course of political action (although it may be used as such), but rather a way of testing the boundaries of our imaginations, of discovering how our own historical situation determines how we can envision our future, and hence becoming more aware of how ideologically constrained and contingent our sense of what is “reasonable” or even desirable is. My intervention in Utopian Television: Rossellini, Watkins, and Godard beyond Cinema is to posit that a “utopian method” can be applied not only to speculative thought, but also to artistic practice: to be a utopian in this sense would not mean creating representations of imaginary ideal places or of the future, but rather transforming what exists in a way that imagines what it might be in the future. I argue that Roberto Rossellini, Peter Watkins, and Jean-Luc Godard, in their works for television, are doing precisely that: they identify elements of television that were present in Western Europe in the 1960s—on an institutional level, a technological level, and a formal level—and imagine how these might become components of a different, better kind of television. They take from the institutional structures and discourse constitutive of European television the concept of “public service”—the idea that television should not be seen primarily as a means of entertainment or a lucrative business, but rather a means for education and civic engagement. On a technological level, they draw out the implications of conceiving of the image not as an object but as a transmission, a form of communication that travels from one place to another but also from one individual to another, and consider the possible advantages of its placement in the home. Finally, on a formal level, they imitate the forms that had become typical of television by this time: an emphasis on speech and “talking heads,” but also the sense of proximity to the real, if unfiltered, immediacy characteristic of television news programs. What makes their works “utopian,” however, is the fact that all three directors alter the meaning and functions of these elements: they detect a potential in television as it exists that is not being fully exploited, that is limited by the current political and ideological conditions in which it exists. Their works thus do not claim to create or represent the future, but enact what Jameson calls “revalencing”: public service becomes not an ill-defined and often hollow concept to serve as cover for the goals of the state/party or an extension of patronizing, universalizing plans to “uplift the masses,” but rather an imperative to critique the state and its policies (as in Watkins’s The War Game) by shocking the spectator with horrific images. Television’s status as a communicative transmission and its placement in the home are used not to create a false sense of intimacy or to function as the extension of state power into the living room (as it was in the hands of Charles de Gaulle), but rather to meditate on the meaning of “communication” and how media usually forbid it, or to invite the viewer to consider how television may function as a disciplinary mechanism (as in Jean-Luc Godard and Anne Marie-Miéville’s two television series, 6 x 2: On and Under Communication and France tour détour deux enfants). The forms developed by television to convey a sense of reality and immediacy are both undermined and exploited by Watkins, insofar as his precise replication of them to depict fictional (or past) events suggests their constructed character while still taking advantage of their aesthetic power. Rossellini, meanwhile, takes television’s affinity for speech to an extreme, replacing the talking heads of newscasters or presenters with lengthy discourses from great scientists and philosophers (in Blaise Pascal and Cartesius, among others), at once imitating television and radically refusing its commitment to short attention spans and easily digestible material. Television as it exists thus becomes the raw material for the imagining of what it might be: its current characteristics, even if they seem to be largely negative, are not negated but rather dialectically transformed, drawing out their promise. The process, however, remains speculative: in other words, none of the three directors actually changed television’s practices or its character as an institution (and only Rossellini had any conviction that this might be possible). They show us—and here we find another key component of utopianism—an “impossible” television, one that cannot exist, due to a wide variety of economic, political, and ideological factors, on a wider scale than their individual experiments. A utopian television, then, is one that does not exist, or that exists only in something like an imaginary or provisional form. It is the fact that it does not and cannot exist on any wider scale, though, that gives it its critical power, leading us to inquire as to why this might be the case, and to imagine what kind of media we want and need. This lesson is perhaps more relevant than ever today: while the public service, state monopoly model of television that dominated Europe in the 1960s is now a distant memory, media institutions, technologies, and forms are changing faster than ever, opening up new opportunities for rethinking and reinventing the roles they play in our lives. Their development will, of course, depend largely on how they can be monetized most effectively, and those who own and finance them will certainly act in accordance with the profit motive. Rather than rejecting the forms of media that develop in this context though, we would do well to look for their utopian potential, using them to think our way out of them. To do so is in fact necessary to avoid the “bad” kind of utopianism, which would simply imagine that one could, ex nihilo, conjure something better than what exists. Instead, we must look for the raw materials out of which we could fashion that which we wish for within those things that seem, at present, the most hostile to our dreams of a better future. Only when we attempt to do this will we begin to see how much those dreams are bound up with the futures imagined for us by the likes of Silicon Valley, Wall Street, or the Department of Defense—and thus be able to free ourselves from them. Michael Cramer is assistant professor of film history at Sarah Lawrence College. 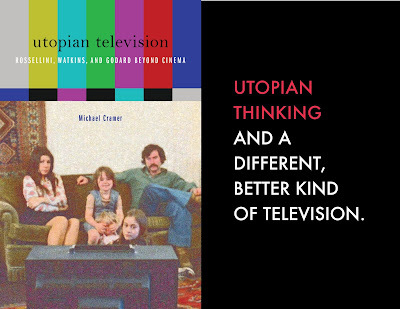 "Both theoretical treatise and intellectual history, Michael Cramer’s intervention matches the utopian vision of its subject as he efficiently and astutely navigates us through the thorny politics of art cinema." 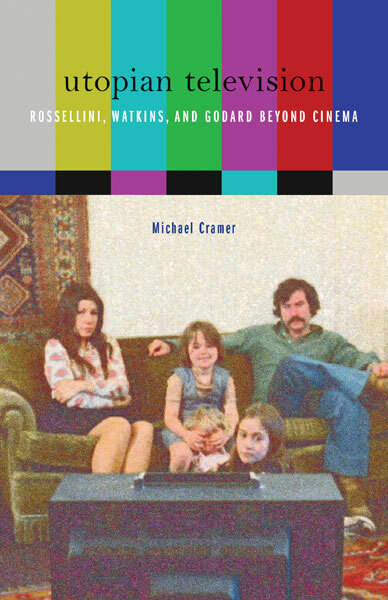 "Michael Cramer's fine book explores those paths not taken that define a genre, that interplay between film and TV pioneered by Rossellini in service of a now utopian social pedagogy. Peter Watkins' understudied work, along with Rossellini's experiments—unfamiliar to those who only know him through the early masterpieces—throw a wholly new light on Godard himself, and Cramer's luminous readings of the works are as stimulating as his overall theorization of this new, or perhaps missed, form."